LMS Journal of Computation and Mathematics has ceased publication. Its final volume is Volume 20 (2017). 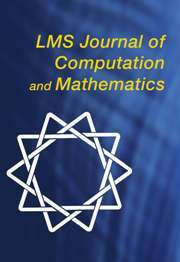 LMS Journal of Computation and Mathematics is an electronic-only resource that comprises papers on the computational aspects of mathematics, mathematical aspects of computation, and papers in mathematics which benefit from having been published electronically. The journal is refereed to the same high standard as the established LMS journals, and carries a commitment from the LMS to keep it archived into the indefinite future. Access is free until further notice.